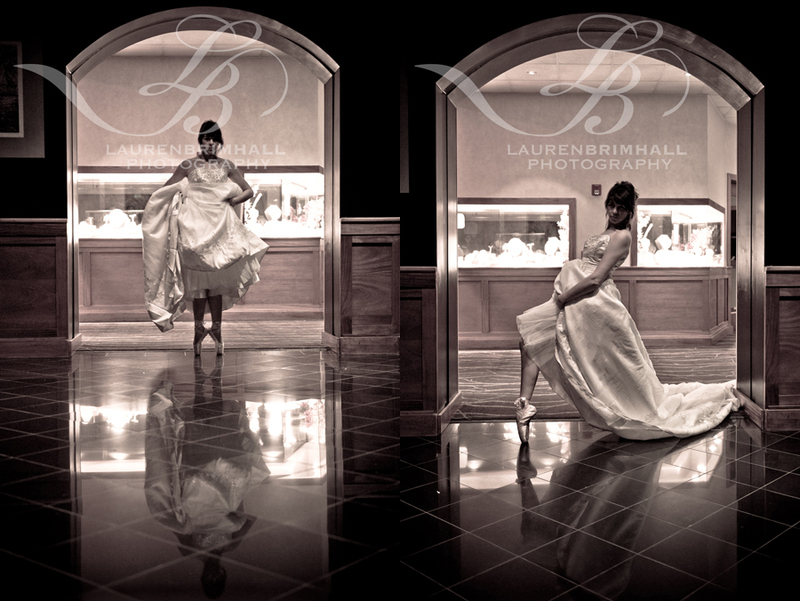 So you know the saying “Sometimes things don’t work out how you planned, but they somehow work out anyway?” Well, that’s a pretty accurate description for what happened with a bridal shoot I had scheduled with five models in Salt Lake City, Utah. Everything was set up through the girls’ agent and I put up the money for the ticket to Utah to do the shoot. Well, to my complete and utter surprise, I arrived at our selected location and waited around for two hours while the girls didn’t call or show AT ALL. I was fuming! My brother-in-law, who I had brought along to assist with the shoot, however, decided to be the hero and call up a few friends. His best friend’s wife, who is NOT a model, said she was up for throwing her dress back on and coming to shoot with us. I emphasize the “NOT,” because when you look at the following pictures from our impromptu session you may have a very hard time believing this isn’t what she does for a living. Due to our previous MIA models, we got a very late start on the new shoot, which made for amazing, but extremely limited-time lighting. On our way to the first location, I decided to pull over and take a quick image at this gorgeous road-side scene. I told the beautiful Maile exactly where to stand, and she did exactly just that: stand, haha. Very aware of this shot’s true potential, I asked her to strike a bit of a more “modely” pose and jokingly demonstrated for her what I had in mind. She took to the direction extremely well. She struck the exact pose, and even IMPROVED it slightly with her own little spin. I clicked the shutter, and from that moment on, we were in business! While I spent a good deal of time inspiring Maile with poses — a first for me, who normally gives very minimal instruction to brides — she inspired me even more. When we pulled over at another scene, as she was walking toward it, she threw the train of her Vera Wang gown to the side to get it out of her way as she walked. It caught me by surprise, and I LOVED the idea, so I had her do it a few more times to fake wind in this picture. Just as before, I snapped the absolute minimum number of pictures I could before rushing back to the car to get to the next location, a slightly beaten down shack. As cool looking as the shack was, though, Maile’s face was even prettier. Trying to get in as many outdoor places as we could before sundown, we hit one last broken down building. Looking at the building from the outside, it wasn’t quite “broken down” enough for me, haha, so we checked out the inside. The light indoors was no more than one small streak cutting through the room, but it wasn’t in the right place to capture our background, so I took advantage of my super-fantastic assistant who held my reflector to cast light on the subject. We weren’t sure if we were going to be able to get Maile’s whole face in the tiny stream of light exactly as it was, but we decided to give it a try. Once we squeezed her in there, I was so into what I was doing that when I told her to look at me, she couldn’t even finding me. I was actually jammed in a corner, kneeling in a pile of broken glass as I took this picture. I didn’t go unscathed, but the minor injuries I incurred were more than worth it! Finally, the sun abandoned us so we headed to the indoor location I had originally planned for the other girls. Everyone involved in the shoot was exhausted, especially me, having gone about 22 hours without sleeping at that point. However, there were just two spots I simply had to have pictures at using my new heavy duty lighting setup. I also got a chance to talk to Maile in the car a little and found out she had been a ballerina! The possibilities immediately began soaring through my head, and being the amazing sport that she was, Maile agreed to stop home to quickly pick up her pretty pink toe shoes. First we took some images like the ones I had in mind pre-ballerina discovery. Then, it got really fun! Now I must admit… there are times when I think many of my photos have “been done.” And while I certainly don’t mind doing them again and again because obviously the familiar ideas are what clients love, it felt REALLY refreshing to have something truly original to work with. I highly doubt if there are a whole lot of pictures of gorgeous ballerina’s, in designer wedding dresses and toe shoes, doing full splits on top of pianos. Again, I can’t say enough about how beautiful and cooperative Maile turned out to be. I feel like if all five “real models” had shown up that day, not one of them would have given me pictures as gorgeous and unique as she did. The other location I really wanted to take advantage of was a simple black tile floor. The reflection cast by the surface was subtle, but I knew it was enough. I swear, there wasn’t one ballet pose Maile didn’t know how to do. All I had to do was suggest them! I had one more very simple shot in mind before we called it day and scarfed our faces in a huge pizza hut pies. To my lovely “model:” I’m so thrilled I was able to give you the wedding photos you never had and thank you from the bottom of my heart for giving me the portfolio photos I almost never had. I learned so much about what an amazing and sweet person you are, and you even taught me a thing or two about myself as a photographer. Professional hair and makeup, perfect-condition dresses, and glitzy venues don’t make photos, people and their relationships with each other do. If nothing else, I know the relationship we formed in just a short couple of hours of shooting together will continue past years and miles. Amazing!!! Lauren, you seise to amaze me!!! My only question?! How are you going to be a guest and a photographer when I get married??? Love these! Those first couple of shots – Wow, makes me want to go to Utah that much more. And the ballerina poses are insane! Beautiful job by model and photographer. Lauren!!!!! You are not only a photographer but a magician too! lol! i must admit, for the first time in my life, I had soooo much fun having pictures taken. Not that I have ever had a real photo shoot but you were so fun and helpful. You brought something out in me….I feel like a junkie, I want to do it again! and again and again! Thank you not only for these beautiful photos but for your priceless friendship. that first picture is amazing – can NOT believe those girls did not show up – but all things happen for a reason – i think these photos might be the best i’ve ever seen from you. keep it up, babe. Those are Gorgeous, absolutely beautiful work Lauren. Great stuff! Love to see you having fun and being inspired and rockin’ the photos! Keep it up!! !